Basically, I had always been interested in anomalies. Then, when I was studying zoology at the University of Queensland, I happened to find a paperback copy of Heuvelmans' On the Track of Unknown Animals. 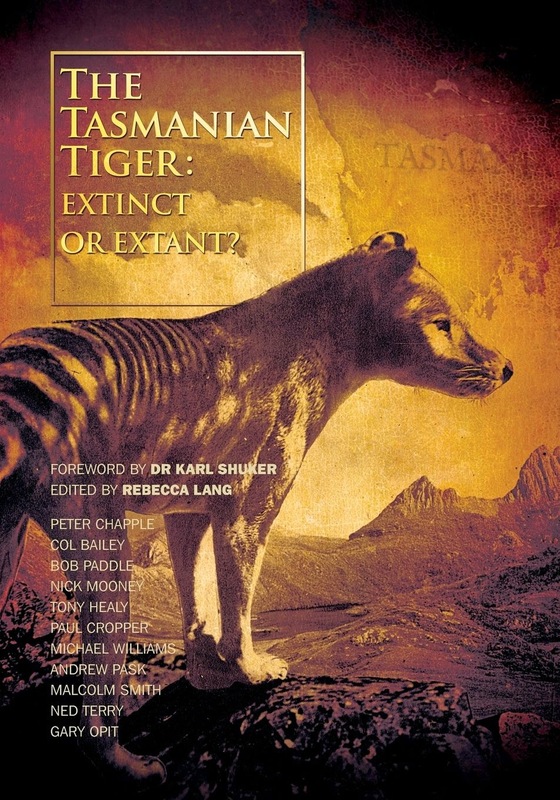 I thought it would one day be a good idea to write a review of Australia's unknown animals. I didn't realise at the time what a job it would be. From an early age I had a pretty wide-ranging curiosity. I was also interested in animals. A primary school teacher gave me a short book on zoology, and that was probably was started me off. I always wanted to be a scientist, and when it came to the crunch, I decided I would prefer to spend my life dissecting rats than mixing chemicals. As it turned out, I ended up doing neither, for there were no openings for zoologists when I graduated. No. In 1977 I was with a group of young Australian tourists at Skipper's Canyon, NZ, looking down at a creature hopping around on the rocks below. It was too far away to be seen clearly, but it was either a funny-looking dog, or the world's largest hare. I could easily convince myself it was the latter, but that would not be intellectually honest. Australian ones, obviously enough. The ones that give me the greatest headaches are the apparent “thylacines” seen on the mainland, because the evidence appears very ambiguous. Apart from that, the giant bipedal apes and sea serpents catch my attention, because there appears to be a mountain of evidence for them. The orang pendek is the cryptid most likely to be discovered first. Apart from that, I think there is a tremendous amount of evidence in favor of the bigfoot, and at least two types of sea serpent: serpentine ones which undulate vertically (obviously mammals – probably whales), and others with long, periscope-like necks (almost certainly not plesiosaurs). 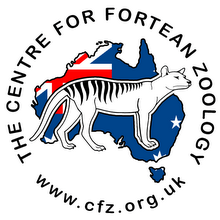 Also, Kurt Engel's has pretty well established that there are feral cats in Australia in the lower size range of leopards. The yowie. I was a reluctant believer, but now it intrigues me. I wrote an article on this in the 2nd hominology special edition of Crypto. See http://www.misfitscentral.net/Big%20Foot%20File.pdf. Essentially, I have no idea what they are, except that they are unlikely to be Gigantopithecus. I cannot see how they could have reached Australia without human assistance. The mind boggles. 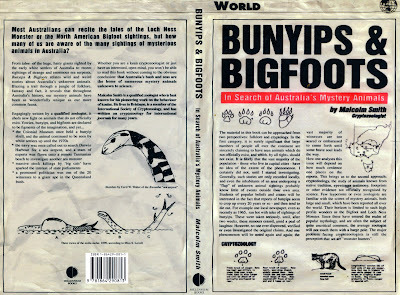 Yes: Bunyips and Bigfoots (Millennium, 1996). See http://malcolmshome.blogspot.com/2011_03_01_archive.html. I also wrote several papers for Cryptozoology. They are mostly cited in the book. Yes. I am in the process of setting up a series of blogs. The first is a self-indulgent one about myself. The second is about humour. Some time before the end of the year, I shall be setting up a cryptozoological blog. Initially, I shall provide translations for some foreign language articles – starting with an old report in an Indonesian newspaper about thylacines in West Papua. None. I have been out of the loop for some years and, in any case, I tend to follow up stories in newspapers, or which I hear from other sources, rather than actively collect reports. However, that is likely to change once my blog is started. I've never come close to finding anything. I interview witnesses after the event – in one case, about three hours afterwards. From Brisbane to Gatton, where I interviewed two witnesses to a yowie sighting. It is case no. 226 on p280 of The Yowie, by Healy and Cropper. 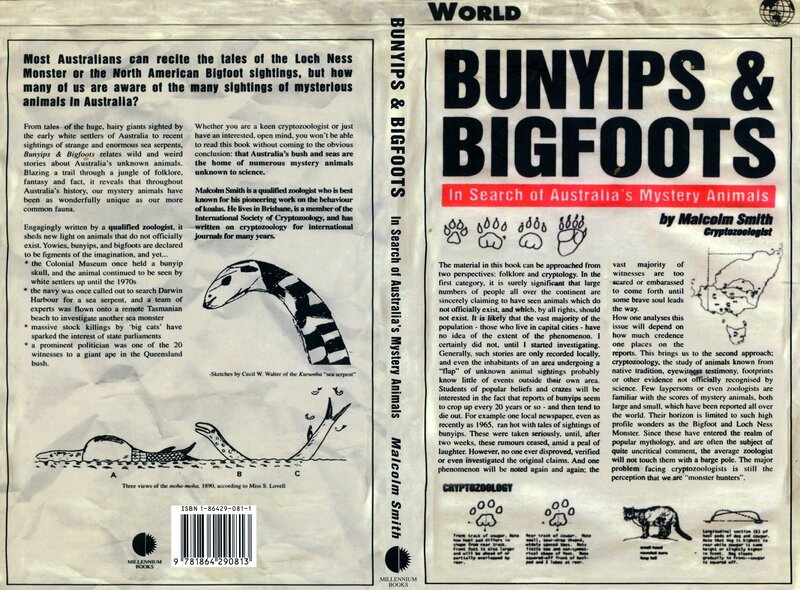 Apart from the blog I intend to start this year, I shall eventually write a new book on Australian cryptids, updating Bunyips and Bigfoots. However, I shall wait until (a) I've sold all my copies of the earlier book (if they're offering them for $1,000 on Amazon, there must be a demand); and (b) the Australian book publishing industry picks up. It's now in the doldrums. • Out of the Shadows and The Yowie by Tony Healy and Paul Cropper . • Learn the scientific method. • Learn basic zoology – at least of the animals in the area under study. • Be sceptical. Always assume, until proved otherwise, that a mundane explanation is available. Remember: a single report, no matter how good, might be wrong, but a hundred are more likely to cover the truth. • For heavens sake, publish the information! On the net, if nowhere else. It's no good sitting in a folder in your home. Guess what? My cryptozoology blog is now running. It is http://malcolmscryptids.blogspot.html . Initially, I shall concentrate on translating some classic French articles into English.